Noah Parets, 13, felt something had changed when he returned to his Sharon home last week, after an absence of more than two months. 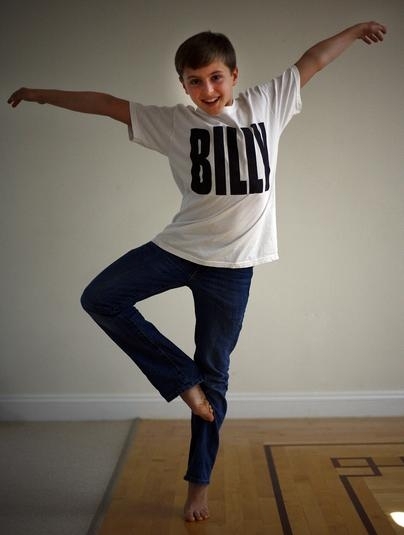 “I thought, ‘Wow, I must have grown, because the house felt smaller,’” said Noah, who is 4 feet, 8 inches tall and made his stage debut July 1 as the star of the Broadway national tour of “Billy Elliot the Musical.” The Tony Award-winning musical runs at The Opera House from July 24 to Aug. 19. Noah isn’t taller than he was in April, but his house may seem smaller because his world has grown significantly since he started training for the demanding role of Billy Elliot. Playing an English boy who confounds his working-class father to pursue his dream of being a ballet dancer, Noah not only has to excel in dance, but also sing and act. Dancing is second nature to Noah, who dances five to six days a week at The Gold School in Brockton and is the American Dance Awards’ Junior Male Dancer of the Year 2011. But he had never acted or sung onstage. Nonetheless, at an open casting call in New York City in September, the casting director was won over by his dancing talent and his first attempts at singing and acting. He was called back to audition again for two full days in January, and he found out he got the part in February. “Footloose” actor and Stoughton native Kenny Wormald also got his start at The Gold School. To learn the part, Noah has worked harder than he could have imagined – 12 hours a day seven days a week. That included three hours of academic tutoring to finish seventh grade at Sharon Middle School, fitness classes and physical therapy. Robyn Parets, his mother, stayed in New York with him during the training and travels with him on the tour, where he shares the role with three other performers and is under contract at least through December. As Billy Elliot, Noah dances many numbers in tap shoes, in particular the challenging, explosive 4 ½ -minute “Angry Dance,” where he releases the anger, frustration and sadness building within him. Since Billy’s mother died, he is raised by his father, a striking miner with troubles of his own who can’t understand his son’s passion for dance. Robyn Parets said she was overwhelmed with emotion when she saw her son perform for the first time. Parets owns and runs Breath Joy Yoga in Sharon and has a 16-year-old son, Ethan, who sings in an a cappella group and performs in musicals at Sharon High, as well as a 10-year-old stepson.